On August 1, 1955 we left Columbus, Ohio on the way to Chile. I was well and truly off on an adventure. One of my pals in Houston was a lad named Jim Lurie, and his father had been a junior officer on the Grace Line before the war. Mr. Lurie had given me his old copy of The South American Pilot, and I had the material between Panama and Chañaral memorized! I was really ready to get out and go! We went overnight on the Pennsylvania Railroad (First Class!) to Union Station in New York. I was looking forward to seeing New York as a (I thought) very mature 13-year-old. The wishing list was pretty impressive even today. First there was the matter of seeing my beloved New York Yankees play a home game, then I wanted to climb the stairs on the Empire State Building, hear The New York Philharmonic, see the American Museum of Natural History, the Planetarium, and lastly, the Statue of Liberty. On the first afternoon, Dad and I took the subway out to Yankee Stadium, and saw a Friday afternoon game with the Boston Red Sox. The highlight was seeing the great Ted Williams get his 2000th major league hit. The Yankees won handily with Whitey Ford on the mound, and Mickey Mantle collecting the winning run. I even saw Casey Stengle have a shot at the umpire in classic fashion. A great day for a Yankee fan. The Empire State Building was a bit more serious. I had heard that if you were really fit, you could get up in about one hour. I did it in 38 minutes, and felt quite proud of myself. (The modern record for the climb is in the order of 10 minutes) The Museum and the Planetarium were not too hard to get to. I was turned loose with some subway tokens and given a map. We all took in the Philharmonic and saw the then unknown (outside of New York) Leonard Bernstein conduct a mixed program well. I did not like Mahler then or now, but we did hear Bernstein conduct New York's own symphony, Dvorak's From the New World. This was Mothers favorite. Mother and Dad were shopping to get all of the supplies and goods needed to complete a 3-year contract in a remote location in Chile. This list included items such as a stove, refrigerator, piano, all the furniture, the lot. It was assembled in a warehouse somewhere on the West Side of Manhattan, along with our trunks that had been sent from Houston. All of the furniture, appliances, and the loose material were packed in a huge packing case some 8 feet on a side. New York was truly cosmopolitan to my eyes at that age. There were restaurants that sold anything you could wish for, stores that sold any record in the world, and endless bookstores. The place had vibrancy about it that I have never experienced again in any city. This was before the muggings became a regular feature, and one could walk the downtown sidewalks and subways in what seemed to be complete safety. Dad took me with him to the Anaconda office at 25 Broadway, where we met the Mistress of Misinformation, Miss Kitty Benson. Miss Benson was supposed to provide information to new employees to help them move to Chile. It was up to her to answer all questions on all matters, and to arrange passage, etc. It was instantly obvious to the most casual observer (me) that she had never been out of New York City. I was also introduced to Vin Perry, the Chief Geologist of Anaconda, Roy Glover, the President and a number of other dignified looking gentlemen. It was obvious that Dad counted for something in this office. He was returning to the Anaconda organization after a 9-year absence. A number of people told me later that he was always counted as an "Anaconda Man", a wearer of the "Old Copper Collar". Dad had left Butte and The ACMC in 1946 in disgust after the huge strikes at the end of WWII. He had been stuck locked up inside the Stewart Mine having to defend Company property with arms, while hooligans and cowards vented their spleens against the company by terrorizing women and children. The Mobs chosen form of retribution was to burn salaried employees houses out on the flat. The Sheriff and his deputies were very distant (and disinterested) spectators to all this. (This was and remains a good argument for not electing law enforcement officers) My Mother had stood up to the mob with a shotgun after spiriting my brother and I away to Deer Lodge. She got real backup from the lad next door, a returned US Marine, who threatened the crowd a hand grenade. Our house was thus spared from the cowards, but many other people that were less able to defend themselves got burnt out. Dad seemed to be getting something back from that after all of those years. He had apparently been marked in Mr. Reno Sales "Black Book" for high promotion when his time came, and that time seemed to be near, or at least in sight. We had to go to the Chilean Consul's office and get our Resident visas fixed up. There was a wonderful picture on the wall showing people with a catch of giant rainbow trout. This served to really focus my mind on Chile as a good place. 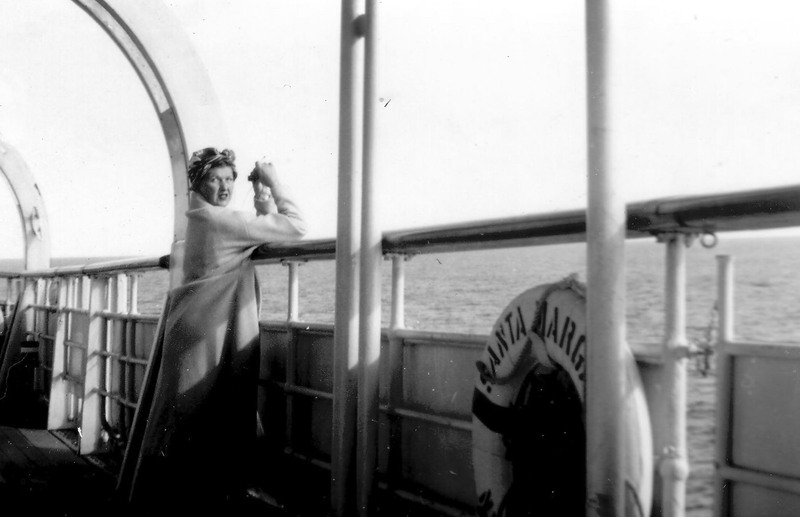 On August 12, 1955 we set sail on the USS Santa Margarita of the Grace Line. The Margarita was a twin to the Luisa and Maria that we had taken to Ecuador in 1946 and 1949. We sailed from Pier 57, and had Cabin 1, the forward premier cabin on the A deck, starboard side. 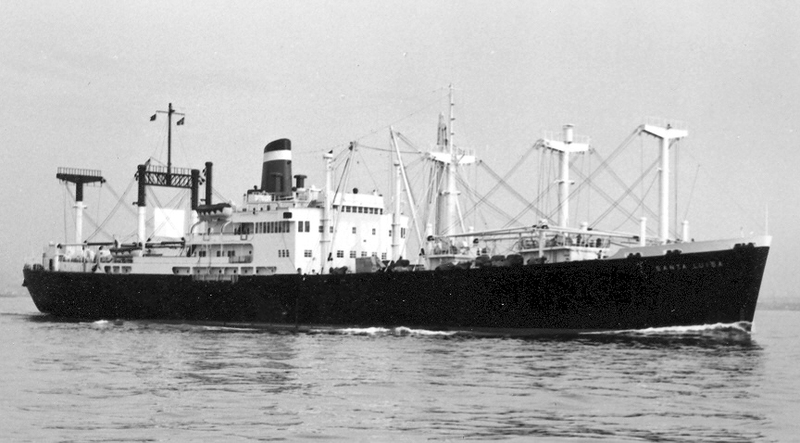 These ships carried 52 passengers, and rated a doctor on board. Most of the passengers were going to South America to work, but there were a few retired types. On the way down the harbor I finally got my look at the Statue of Liberty. The voyage started out all wrong. We sailed at 1PM, and by 4 PM I was convinced that the Captain was crazy. The setting sun was directly off our stern. I ran up to the top observation deck, immediately above the bridge, where the spare compass was shipped. This seemed to confirm that we were headed toward Le Havre at best. I struck up a conversation with the Radio Operator, who informed me that we were steaming (oiling to be proper) as far to the east as practicable to get around a massive hurricane that was working its way up the Atlantic coast. As soon as we were far enough east of the projected center of the storm, we would turn and bear south. This would put the ship bow on into the worst of the wind and seas, and restrict the side rolling of the ship. By the time the sun had set, we were obviously in for a raging night. At dinner Captain Berg announced that the decks were closed excepting the rear A Deck. This looked directly over the swimming pool and was protected on all sides. A trip back there revealed some truly impressive seas that were washing over the lower deck, with some of them slopping up to the level of the A Deck. A quick way to fill the swimming pool! I went to bed every inch of me a blooded mariner. Morning revealed a wild scene. The waves had grown in amplitude to the point where you were looking up from the cabin at the oncoming seas before they struck the bow. The wave would then break over the fore deck and crash against the house. As the cabin windows formed the front of the house on A Deck we got to see a lot of water. I later found out that we had passed within 50 nautical miles of the eye of the hurricane. The day after the hurricane passed, we came on deck to glorious weather. We were just entering the Windward Passage between Cuba and Dominica. When I had previously made this trip, this passage of water had stirred up all sorts of ideas about the old pirates on the Spanish Main. I was much more interested in the workings of the motor ship this time, and had by then formed a good friendship with most of the crew. The inner works of the ship were out of bounds to the passengers excepting one tour of the engine room, for men only. I had already worked my way into the radio operator's room, and was busily occupied there "helping". The man had a new radio telex machine, and he made it my duty to feed the thing with sheets of paper when the morning messages came in. This soon led to an introduction to the Chief Engineer and access to the engine room. Here I had an intimate look at the machinery of the ship, and made a great discovery. 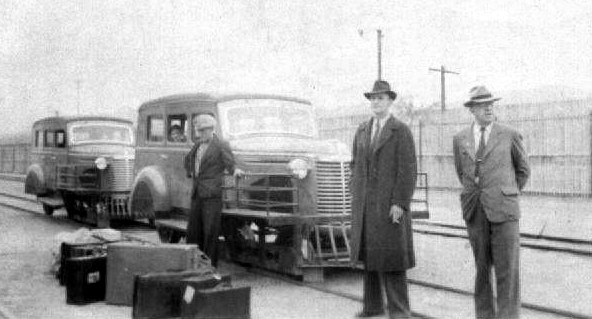 There was a brand new Chevrolet Suburban Wagon in the forward hold, and it was addressed to Dad, at Chañaral, Chile. I asked him casually if he had bought a new car while we were in New York, but he denied this. He immediately demanded to know why I was asking the question so I told him. The car belonged to Andes Copper but our family had a right, as paid First Class passengers, to transport one motor car for free to our port of destination. It did, in time; end up in the Geology Department. It was 5 days to the Panama Canal from New York, and the passage of the canal was a carbon copy of what I could remember from 1949 on the Santa Maria. After passing through the canal we were on our way down the West Coast of South America. My Dad picked up just at the thought of it. Our next stop was Buenaventura, in Columbia. The sole occupation of this town seemed to be to rot the husk off of coffee beans. These were spread out in great piles on the wharf, and alternately allowed to rot, and then dry. The smell was amazing. The ship unloaded a bit of machinery and other goods, and proceeded to spend two days loading sacks of coffee beans by hand. We were happy to leave Buenaventura behind and get on to Puna. This was our old homeport, and I yearned for the chance to take the Santa Rosita up the river to Guyaquil. Alas, it was to be a one way trip only. We sat at anchor for about 18 hours. A huge human chain of stevedores carried an endless supply of green banana stalks up very shaky planks from lighters and into the refrigerated hold. The Rio Guayas was still the same, stinky and muddy. The next stop was Talara, which was only just south of the Ecuadorian border, but obviously the start of something new to me. The jungle was gone and replaced by a desert. The salt water in the pool was cold, all within 5o of the equator. The famous cold Humboldt Current causes this. Callao, the port for Lima, Peru was next. It was notable by meeting Carlos Plenge. He had attended the Montana School of Mines with Dad, taking a Masters Degree in Metallurgy in 1935-37. He had us for lunch to celebrate Dad's birthday on August 21, his 42nd birthday. Afterwards we all went to the bar of the Hotel Bolivar and met with Allen Engelhart and his wife. Al was the General Manager at Cerro de Pasco, and like Dad and Carlos, a Montana School of Mines man. He had been the Manager at Portovelo in Ecuador where we had lived between 1946 and 1951. As we left we met Bill Honeywell, a mining engineer type that had worked at Portovelo as well. He was working as a mining machinery salesman out of Lima, and seemed to make his living drinking booze. Rudyard Kipling wrote about the emotions of Anglo-Indians returning to India, and what we felt about West Coast South America was just like that. "Here was the land we knew and loved, before us lay the good life that we understood, among people of our own caste and mind." The next stops were at Mollendo, Illo, Arica, and Antofagasta. The ship stayed here for three days while a huge tonnage of copper was loaded from the mine at Chuiquicamata. 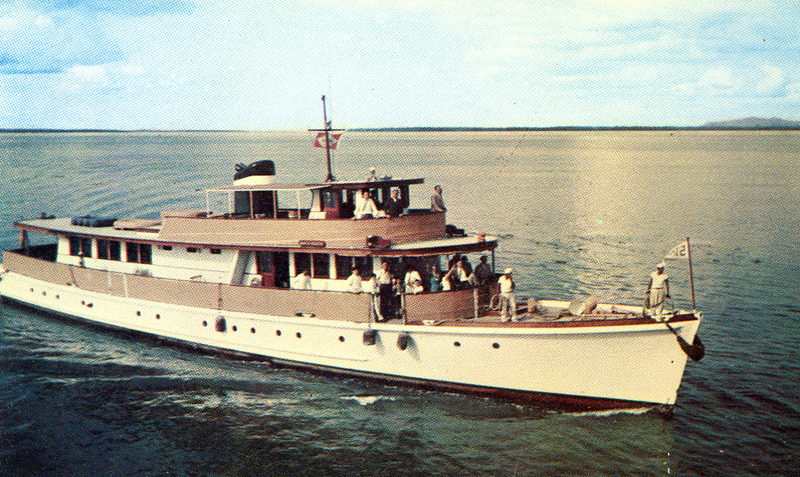 The next afternoon, Thursday September 1, 1955, we arrived at Barquito, our Port of Call. This appeared as a small settlement that was pasted on to some granite rocks about 1 mile west of the port of Chañaral. The picture below shows my Mother contemplating her future home. There were a number of large oil tanks, a power station and a small dock. The Grace Line tug came alongside, and it immediately showed that we were back in the hands of The Anaconda Company. Its name was Colusa, obviously (to someone from Butte) named after the famous mine at Butte. The great point of interest now was getting off the ship. Hurried good-byes were made to the people that we had met, tips provided to the waiters and the like, and over we went. A very narrow gangway had been lowered. There was a tremendous swell, (which was not usual) and the obvious difference in weight between the tug (The Potrerillos) and the large ship caused them to rise and fall with very different motions and times. This was pretty tricky. You had to grab a rope, wait for the two vessels to coincide and leap. If you caught it on an upstroke, you got a nasty hit when you hit the other deck, and on a down stroke you could take a fall of 6 or 8 feet, enough to really hurt you. Dad and I did it OK, but Mother had a hard time of it. This came as a real shock to me. Not 5 years before she could step off the back off a horse at a good speed and land on her feet running. Dad eventually got her into his hands and simply lifted her on to the tug. Mother had major surgery for thyroid cancer in 1952, followed by a heap of radiotherapy. I found out many years later from my Grandmother that Mother knew the cancer was back when we left for Chile, but had told no one but her. She also had to take a lot of medication to replace her thyroid gland, and the pills had a terrible effect on her balance, both physically and mentally. It was not a good situation. She was, however, very happy to be back in South America where my Dad was happy. The next test was to get off the tug and onto the wharf itself. This was done by grabbing a rope and swinging a la Tarzan down on to the platform. Great when you are 13. The crew had a special platform that they rigged for Mother, and she went over like a lady. Mr. Peake met us and informed us that a number of our trunks had fallen from a cargo net, and were on the bottom. It would be a month before a Navy Diver was due through, but "not to worry, we always get them back". It turned out to be only two of the trunks. One was full of Dads books, which were inside rubber sealed ammunition cases. They came out as dry as toast, and I have many of them today. The other had the silverware and the phonograph records in it. The silverware sits on my table today, but the record collection was ruined. Barquito was the terminus of the Ferroc. de Potrerillos, and was the port of the Andes Copper Mining Company. For people from Montana, it was obvious that the initials of this mining operation were the same as those at Butte. (I often wondered why some acronymophiliac had not named the railroad the Barquito, Andes and Potrerillos, to follow the Butte, Anaconda and Pacific at Butte!) The actual trip to Potrerillos (10,000 feet high) was made in a 1946 GMC Suburban Autocar. The trip to this quite forbidding looking mining camp was only 150 kilometers in a straight line, but about 200 on the railroad. This trip took most of 5 hours, which is pretty slow by any standard. We spent the afternoon walking over to Chañaral, filling in custom forms, and generally looking around the place. We met with the urbane and charming Customs Inspector, Don Norberto Rojas. He was later to become a good friend and fishing companion. I remember gray clouds and cold weather today. The guesthouse was furnished as all guesthouses are with thin blankets and thick crockery, all listed out on a mimeographed sheet with many alterations in many different hands! We went to dinner at the Rancho where we got a very pleasant surprise. The fresh Congrio was absolutely first rate, as was the very cheap red wine. The trip on the autocarril started at 12:30 and culminated with arrival at the Potrerillos rail station at 5PM. After you left Chanaral, the rail went past the outcrop of a large granite batholith. This hillside on the left with its prominent basic dikes is one of the great outcrops for a geologist to see in his lifetime. My first photo taken in Chile is still with us, and included here. Vertical basic dikes in the Permian Chañaral Granite batholith, east of Chañaral. The rail went up the tailings creek (the Rio Sal) past Salado, Pueblo Hundido, (where we waited for the down train full of copper to clear the track) on to Llanta, the F de P rail headquarters, and thence up a narrow valley that rapidly became a deep canyon. The mine had to be up there somewhere, because the tailings stream and the power line were both right beside the track all the way. After about 4 hours, the walls of the canyon rose to over 3000 feet above the bottom and the grade of the rail became so steep that the railcar was in low gear. The ever-present tailings then disappeared up a steep gorge to the right, as did the power line. These were good clues that we must be getting close. At this point the rail left the bottom, and started up a cut that eventually led to Potrerillos. The alarming bit came on the steep curves that were cut into the walls. The brakes on the machine were operated by the steering wheel. Going around a left-hand bend while the driver frantically turned the wheel to the right was a bit unnerving. 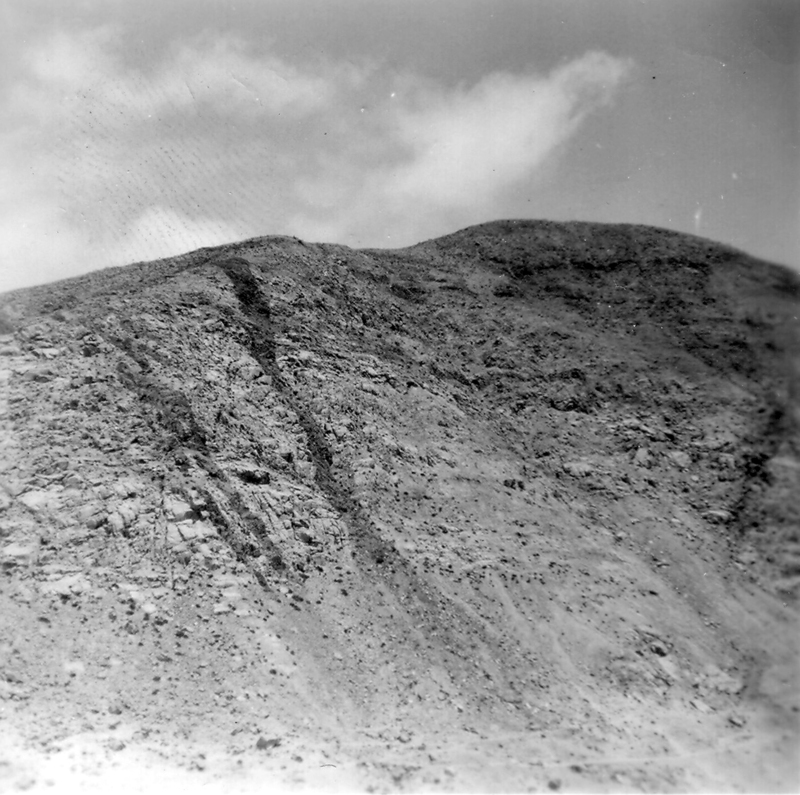 We arrived at Potrerillos late in the afternoon of September 2, 1955. It was a good mining camp, and was run by some of the nicest people that I have ever known. Ed Brinley met us, and escorted us to a comfortable house on the lower southwest side of D Row. The Bates lived on the uphill side, and the Dudley's downhill. I was entered into the last half of Grade 7. The teacher was Mrs. Nona Marsh, and she looked at my name and asked if we came from Deer Lodge. When this was confirmed, she said to “ Tell your Father that Miss Sackett is here”. She had taught at Powell County High when he was there. She had just gotten her chance to terrorize the second generation of a family! She was a tough teacher, but she also got results. We were also required to take part of our schooling in formal Spanish. My classmates in the 7th grade were Billy Bennett and Pat Daspit. I think that Joan Novak and Judy Vetersneck were in Grade 8. As with all kids, you almost never really remember the younger ones. My first impression of Potrerillos is one that still is with me, 49 years later as I write these words. (Luck finds me writing this on September 1, 2004, 49 years to the day that we arrived in Chile. I am whiling away an evening in the office of a small mine at Cloncurry, Queensland, a place almost as desolate as Potrerillos, but without the saving grace of scenery). The topography was stupendous, almost magical. 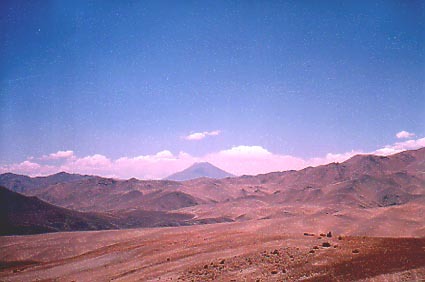 The wonderful and graceful outlines of Cerro Vicuna to the SW, with its arcuate and cockscomb ridge trailing to the north, and serving as a left frame for the sunset is the first feature. Vicuna was easily seen from the Margarita before Chanaral was sighted, and was the constant visual contact during the whole of the rail car trip. The modernistic clash between the nearly flat pediment of tertiary sediment and the hills to the NW made the other side of the frame for the sunset. To the west was a vista as long as a man could see over the curvature of the earth. I learned spherical trigonometry trying to prove that you could see the ocean from the bottom of D row! (In theory you could.) Then to the NE, rising like a magical mountain out of the foothills that were spread around in a chaotic pattern rose the form of Dona Inez, with a coat of snow. Purple streaks peeked out through the white, which shone like silver, and then in alpine sunset gold, to show the angular form of this most graceful volcano. The only thing missing was a plume of smoke. The alpen gluehen in the late sunset was the greatest in the world. I initially started out being quite friendly with Billy Bennett. Bill had a light motorbike, and would roar around the curve in front of the house in fine style. Bill's Dad was the General Manager, but was certainly subordinate to Mr. Koepel who lived in the Gerencia over the way from them. Potrerillos must have been the only mining camp in South America where the Manager did not live on the top of the hill. Bill and I did quite a bit of poking around the gulches below the limestone mine and found quite a deposit of agates in the volcanic agglomerates at the bottom of the gulch immediately below the Gerencia. Mrs Bennett was very interested in these agates, and surprised me by climbing down to and back up again from this place with the greatest of ease. My Mother cut quite a few nice cabochons out of these small-banded agates. Billy was very much the Manager's son, spoiled and very confident of his position in the scheme of things. He was also contemptuous of his Fathers superiors and inferiors to the other kids, which my instincts led me to believe was not a healthy thing! Our friendship sort of ended about as soon as it was started. Our first family expedition out of Potrerillos was to go to Indio Muerto. Bill Swayne picked up Mother, Dad and, myself early on the morning of September 18 in his Dodge Power Wagon. We drove to the small camp at Indio Muerto, arriving by 9AM. Dad and Bill spent the whole day clambering all over the mountain looking at drill sites and outcrops of what had been proven to be the leached cap of a copper deposit. Exactly how big a deposit remained to be proven, and this was Dad’s major job over the next 6 months or so. Mother and I spent the day mining a large amount of gem and near gem quality turquoise from the old Inca (Coya) mines. These were simple “dog holes” that had been dug with very rudimentary wood and stone tools. Proper work with “modern” picks and shovels certainly brought out a lot of turquoise. It was very pale compared to the stuff sold in gem shops. I have a surviving piece from this trip and did an X-Ray Diffraction test on it in 2001. It is indeed really turquoise, and by boiling it in olive oil, one can get a superb color, just like the ones in the gem shops. Too bad we did not know about this in 1955. Mother had purchased a gem polishing and faceting machine in New York, and she used this to really good effect. She produced a huge number of cabochon stones over the next two weeks. Many of these were given away to various people, and some were set into jewelry, but by whom I do not know. Over the weekend that included the holiday Todos Santos (Or San Pedro y Pablo, November 1) we made a trip to La Ola to try the trout fishing. All my trout fishing had been with flies, and this did not work here. You could see the damn fish and they would not rise at a thing. Dad soon pointed out that perhaps since there were no mosquitos, there were no insects at all. I tried a small spoon and got instant recognition from at least one fish. It turned out to be a slow day, but I ended with three beautiful fish in the 15 inch class. They were top eating. The trip was almost magical, getting up on to the real altiplano, right at the feet of the volcanoes. I felt cheated that none of them were active! One of the more humorous events that we experienced (it was funny to some of the family) happened in the first week. Dad owned a fine old Harris Tweed coat that he had purchased as a student in 1936. This coat had sort of gotten into the public monument category, leather elbows and the like, and was much loved but worse for wear. Mother had made a few attempts to dispose of it over the years, and she thought that she had at last succeeded. She had put it into the garbage can when we were packing up in the States. When she was emptying the last of the trunks, the one with the guns, tools and fishing bits, here it was, carefully put away. Pop had obviously spotted it and gotten it into the one trunk that he could pack without fear of supervision. Just at the moment of discovery, there was a knock on the door. It was a fairly ragged and coal dusted man whose duty it was to stoke the furnace every evening. He was very pleasant and courteous to Mother who formed an immediate and lasting friendship by making a present of the prized Harris Tweed. She nicknamed him Don Sucio, Sir Filthy. A few nights later Dad commented that he had seen the “Coal Man” wearing a “really good looking tweed coat”. He said he would have to speak to him and find out where he got it! I soon became very good friends with Charles Bates who lived next door. We got into climbing, and got on top of all the local peaks on weekends. 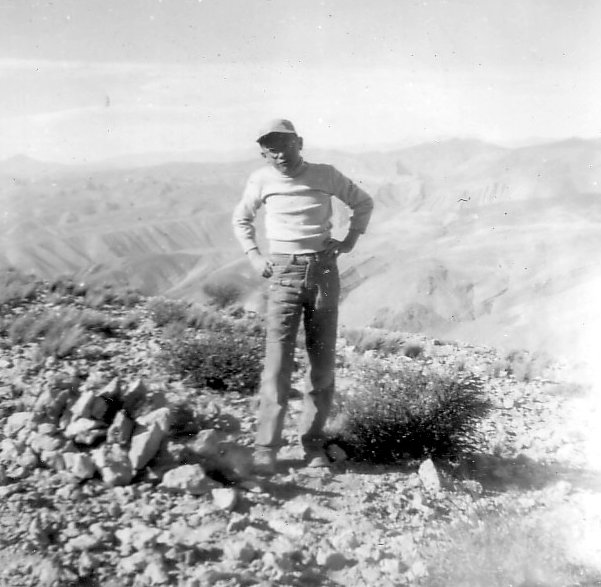 The picture below is of Chuck on top of the Smelter Hill, October 16, 1955. This got me up to around 14,500 feet, higher than any point in the main USA. I also got my start in the lime industry by meeting Pappy Johns and hanging around the limestone quarry and the limekiln. Potrerillos was a wonderful camp for a boy of my age. The social life was very different to that I had experienced in the USA. The girls were all into dancing and being a lot more grown up. Like children everywhere they imitated their parents, and when they had social functions they tended to be formal with proper dress. Dad was absolutely happy in his new position. I will never forget his absolute joy when he came home from one of his first management meetings. This was one of Mr. Koepel's famous "confession" sessions. Dad's delight was that the company was not only staffed with nice people that were competent, but that the upper management was modern and top class. He soon came to the opinion that Mr. Koepel was one of the original nice and competent people. I have recently ( March, 2005) recovered all of my Mothers letters that she wrote home during this time. She wrote that” Frank feels that his career is made, a top position with pleasant people and a chance to do the greatest and most complex geology job in the world” She was certainly right! One of the most pleasant surprises came a few nights after our arrival when the Mine Superintendent, John Hoffman, asked us to dinner. It turned out that Ole Olsen who had been the Mine Accountant where we had lived in Ecuador was Oulgita Hoffman’s father. 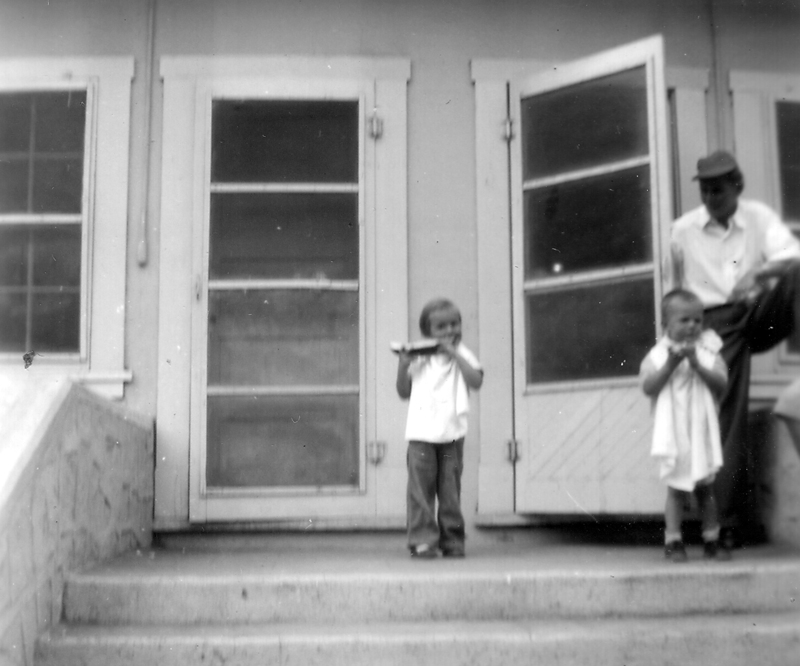 We had known her sister Nancy and brother Edgar when they came to Ecuador to visit for several months in 1950. When we knocked on the door there was Nancy to surprise us! This renewing of a very old and valuable family friendship really set the tone for our familles love of Potrerillos. Sadly, Ole was not well, and died before we could get to Santiago to see him again. Gene Wheeler (Who worked for Dad in the Geology Department) had started a Boy Scout Troop of sorts. Along with a lot of other activities, he proposed a fishing trip to Pan de Azucar. This was the most popular idea that he had come up with. The whole outfit went to Barquito on a mid afternoon on Friday (in spite of protestations about Monday's composition from Mrs. Marsh) in a special track car, and camped in one of the upper row houses at Barquito. The party was joined by Messers. Koepel, Bennett, and Libenow the next morning, and all headed for Pan de Azucar. The adults certainly knew what they were doing, and were equipped with the latest spinning gear. The Trask's were hicks from Montana, and I had some fly-fishing gear and one hand line, all obviously unsuited for catching the magnificent linguados, or flounder. And the fish were really biting! Instead of bitching about not having the right gear like the other kids, I got one of Mr. Koepel's gaffs in my hand and made myself useful helping the adults to get some fish up on to the rocks. I had an admiration for this man, then and now. He was the real thing, a strong and powerful leader that demanded absolute respect, and gave a lot of warm affection back. He soon saw that I was interested in fishing and really did want to catch one of the linguados. He stopped everything, showed me how to rig up my hand line, and how to cast it. When I caught a really nice fish on the first try, he helped me land it, and took my picture. He also gave me a little homily about the value of respect for your betters and hard work, and declared that he was my friend. Dad was asked to go to Bolivia to look at a natural gas field. This meant that he was to be away over both Christmas and New Years. Potrerillos was a dismal place for Christmas as far as Mama was concerned. She had a magnificent set of old German hand blown glass ornaments for a Christmas tree, and it was her annual pride to put these to use on a proper Christmas tree. It was unimaginable to her that there was not one for sale. At Portovelo, the company provided you with a live tree in a tub that was kept at the Company Garden for most of the year. Even Bonanza, in Nicaragua, which was in the snake infested Central American Rainforest could muster a decent Christmas tree. As Christmas got closer, she became pretty inquisitive. Finally Mr. Libenow informed her that no one had ever ordered or gotten a Christmas tree in his knowledge. Mama was not very easily defeated. She went around to See Mrs. Fines, who has several Pencil Pines in her garden. With MariLu’s help, the two of them raided as many branches as could be cut off the various cedar trees around the place. Mama assembled them into a magnificent Christmas tree that was admired by all who saw it. I became ill on Christmas Eve and was sent to the hospital with suspected appendicitis. This turned out to be a false alarm. On New Years Day I was home alone with Mother when she suffered a massive stroke at 3:30 AM. The head Doctor did not respond to my call for help at 4AM. (He told me she had a hangover, a very poor telephone diagnosis, and almost certainly a critical mistake in the path that lead to my Mothers very young death a year later.) I finally got Bess Barnes from the hospital to pay some attention, and Mother was taken to hospital around 8 in the morning. She was packed up and sent to the company hospital in Barquito within the hour. This was a sensible way to lower blood pressure. Since it was school vacation, I was sent along a week later to help look after her. Barquito was where many people would take a week or two off to escape from the altitude. I spent the next two months more or less on my own in a fairly immoral Latin American seaport. Just the place to be when you are 13 going on 14! Iwas placed in one of the lower duplex houses, over the road from the Rancho, and lived on my own, going to the hospital and trying to keep Mother company. She was sick, partly paralyzed, and distracted and did not really want anyone to see her unless she was having a good day. Dad arranged people to look after me as best he could. The first week I had my meals with Roger Forget and his family, the next week, I lost the house, or rather, shared it with Kathy and Ernie Lucero. The week after that I ate lunch with the Dunstan's, the week after that with the Hoffman's, etc. I got to know a lot of fine people, who were very kind to me. I also got to know my way around Chañaral in a way that might not have been too acceptable. I became a regular on the Potrerillos, the Andes tug, and the Barquito, a small workboat that also had a bowsprit on it in order to harpoon swordfish in the right season. The Potrerillos can be seen on the left, and Barquito immediately below the right elbow of the rear man. These boat crews were really nice guys, and interested in fishing. I became a very good friends with one Gaston who showed me the ropes when it came to local fishing. I believe that his last name was Giepert, but I am not positive. Inshore fishing off the rocks was pretty slow, but not impossible as the photo below shows. I made a forbidden (or rather secret) overnight trip off shore with one of the deep-sea fishing boats, and had the time of my life helping them pull in the fish on long lines. Of all the things that I remember from that two months in Barquito, what is overriding today is the people. The Trask's were in reality strangers to Potrerillos, but we became "family" to everyone. The real love and friendship shown to me by these various people is to me what Potrerillos was all about. It was certainly all for one and one for all when it came to belonging to the Potrerillos community! I will list a number of scenes that sit in my mind about people and places. Eating lunch with Henry, Peg and John Dunstan every day for a week. I had never seen an Englishman handle a knife and fork that way before and was fascinated. Instead of being insulted, they taught me to eat that way. It scandalized my Mother! The smell of cedar trees in the hedge by the gerencia on a warn night. Mrs. Marsh came down for a week, and held court for all of the school age kids. We went to her place for Scrabble and Bidu (A horrible Coca-Cola imitation) every night. The Scrabble competition turned into a pretty good school session. I learned how to hold hands and giggle in the dark with a young lady named Marla Grey. We left our initials scratched in the plaster under the porch of the duplex next to the hospital. They might still be there! The Doctors and nurses in the hospital that looked after Mother. Not only did they do this well, but also they looked after me. They taught me to play Canasta in the evenings, and I skinned them all at it after a few weeks. I cannot remember their names, but one of the nurses later went to Potrerillos and (I think it was she) married Sergio Chaves. They were great fun, and their obvious concern and competency rested my mind about Mother. Listening to Slim Welch tell of his home in Alabama, and about how the gold watch he was given for 25 service to Andes turned green every summer. Sneaking a ride to Pueblo Hundido on the "Up" train in the morning, and making it back to Barquito for late afternoon on the "Down" train. The train crews were great guys and good friends. My birthday present that year was a return to Potrerillos on March 8, 1956. By this time Mother was starting to recover, and was able to get out and walk around the place. She was put into one of the duplex houses (C5) on the lower row, just above the police station. A maid was hired from Chanaral, and Mother seemed to be on the mend. Dad took me back to Potrerillos, and to what seemed like prison life, homework and schedules. I could not even remember what side of a column of numbers to start to add from. Dad and I drove down to Barquito on Friday nights and returned late on Sunday afternoon. Andes was always very strict about people checking in by phone when they left Barquito, calling again from Pueblo Hundido, and then checking in at the gate. Mr. Koepel would personally stay up if a car was overdue. We always stopped and checked in with Kep before we went to the house. We often got a ride from Mr. Bennett or others that might have been going down for a weekend, and this meant that there was a new truck or automobile that needed to be driven “up the hill”. Once we got a brand new Chevrolet Sedan that went directly to Harold Robbins. The next weekend we were to pick up another one, and I thought that this was going to be OK. It turned out to be a new van for the Pulperia, and a real dog. It turned the usual 2-hour trip into 4 hours, with the entire hill climb being done in compound gear. There was no passenger seat, and I did the trip standing and hanging on to a pole in the back. We also got anyone that wanted to come back and forth as passengers`. There was one trip where we had an attack of the “flats”, with both spares being punctured before we got to Pueblo Hundido. We got them fixed there, and called ahead to Potrerillos. We had another flat by the Inca del Oro turn off, and the next one at El Jardin. One of the passengers was Breese Rosset, a famous and crusty mining salesman noted for his hard drinking and gambling. He was no athlete, as he chose to sit in the car and wait. Pop and I walked up the hill in the moonlight. We were about 100 meters from the gates when Blaine Wiseman pulled up with 4 new mounted spares. It was nice night for a walk, but very cold. On another trip, the steering rod on the Geology Department “Green Dragon” or GMC Suburban wagon snapped off. This happened just as we got over the grade coming up to the Inca Del Oro turnoff. If it has happened 100 meters earlier, we would have been over the side of the Quebrada. Both of these instances showed the wisdom of having people check in when they came and went. The house was a mess with Dad working hard and not having any domestic help. He had tried many times to hire a maid, but none came forth. We ate at the Rancho, so at least the Kitchen was clean! Josefina and Harold Robbins asked Dad and I over for dinner, and Dad briefly mentioned to her that we needed to hire some help, because Mother was coming home in 2 weeks. We went to Barquito on the Friday night as usual. There was a message waiting from Josefina that she had hired a maid for us, and that she would be in the house when we got back. I have no idea to this day what Josefina or for that matter maybe many other ladies of the camp did that weekend, but on Sunday night the house was immaculate. Her name was Raquel, and she was magic. Raquel became a companion and friend of my Mother as well as a housekeeper, and remained with us until Mother died a year later. After that she helped my Dad pack up the house, dispose of many articles, and move up to a duplex on B Row. Raquel was offered a retainer to look after the place in Dad's absence, but she refused, and returned to La Serena where she had come from. I am convinced many years later that she had done what Josefina had asked her to do, and had simply gone home with her job done. 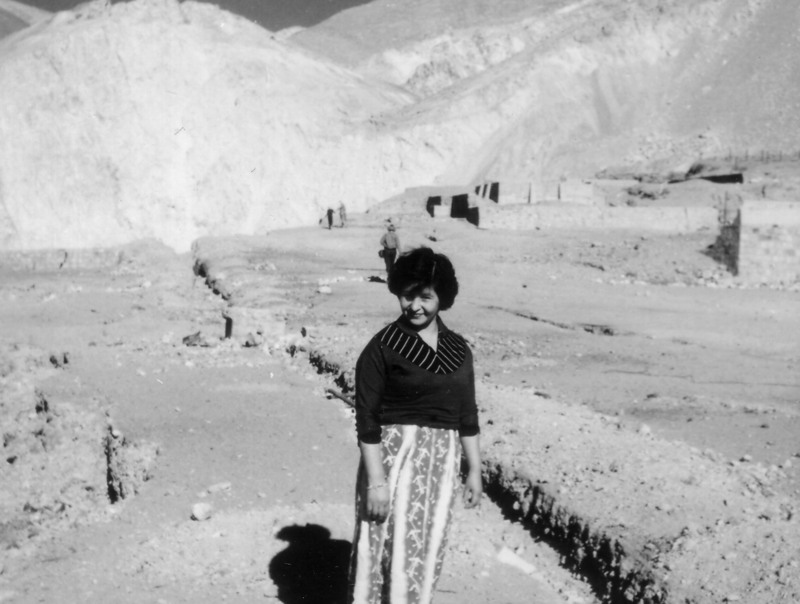 Raquel, My Mothers Maid, nurse and Companion at La Mina on the last day of operation of the Old Mine. 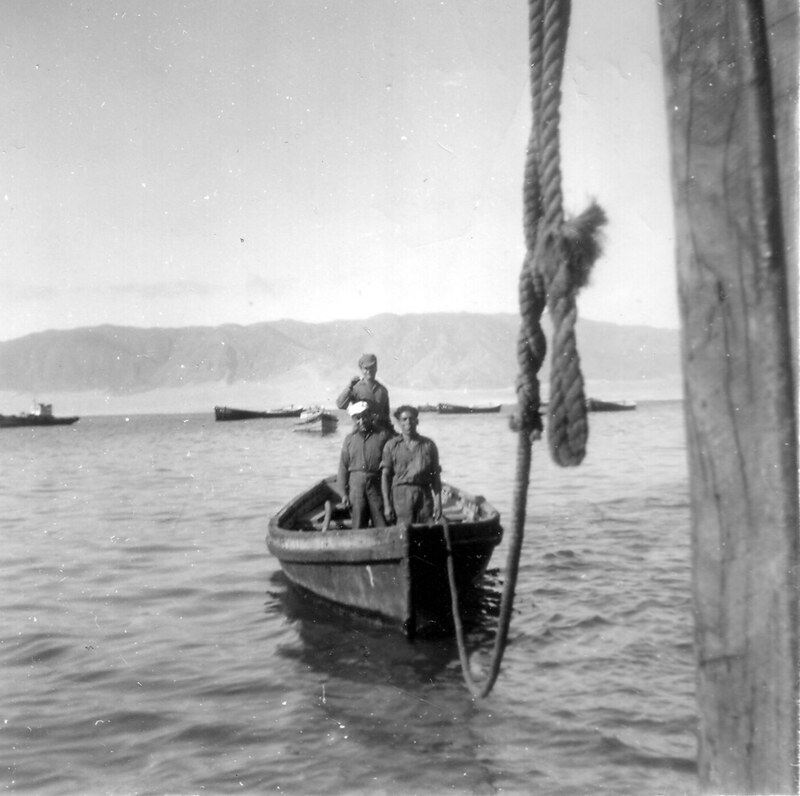 In early April, Bill Swayne came through town, and invited me to go on a weekend trip to visit a prospect inland from Taltal with he and Blaine Wiseman. I had a grand moment sitting casually on the seat in the back of the new Geology pickup, waving to the kids at recess on Friday Morning as we sped by. Revenge was Mrs Marsh's on Monday morning. We got back about 10PM on the Sunday night after an exhausting trip, and of course I had paid no attention to the dreaded Monday Morning Essay. There were a number of caustic comments made that left me squirming in my seat, but unrepentant. The next great expedition was a duck-hunting trip to La Ola. Dad had a school chum, Melvin Williams who was the salesman for Joy Machinery in Chile. Mel had come through Potrerillos on his annual trip, and they proposed to go to La Ola at 2 Am on the Sunday. Our companions for the trip were to be Ferd Liebenow, Blaine Wiseman, Carlos Riebeck and Len Holman. It was late May, and bitterly cold. I rode out with Blaine Wiseman in the new Geology Department Ford pickup. Mel was in his vehicle with a friend who was a high officer in the Carabineros. Dad was in another vehicle with Len, and Ferd and Carlos drove their sedans. We arrived at the small keeper's house at the dam well before dawn. I can recall that the man stoked his potbelly stove with a mixture of bunker oil and coal, and it was red hot. His dog went out to the dam for an early morning swim, and had to break the ice to get in! Tough dog. He had also put up a good number of ducks, as you could hear the gackle of them as they flew off. There was one less shotgun than party members, so that meant that boys did without. I got the exalted job of driving up and down the creek trying to put up the ducks so that they would fly past a number of corrugated blinds that had been placed along the creek. There was a tremendous wind with a temperature of about -20oC. The ducks stuck right on the water when they flew, and they moved fast! I chased a number of flocks from the marsh down to the dam, and then back up again. At one point, I chased a huge mob of ducks in front of the blind where Ferd Libenow was shooting. I saw two ducks fall on the other side of the creek, and stopped the truck to walk over and pick them up. He surprised me by stepping out with one hip wader on and plunging into the creek to get to the ducks ahead of me. He must have noted my open mouth, and shouted to me to not worry, one leg was wood! When the hunt was over in the early afternoon, I rode back with Ferd, and listened to his stories of life in Bolivia and Chile in the 1920 and 30's. He originally came from the Yaak River valley in Montana, and treated me as an equal. I wish I could remember even a fraction of his stories today. I used the plot of one of these stories for one of Mrs. Marsh’s dreaded Monday Mourning essays a few weeks later. I got an "F" along with a curt note not to listen to Mr. Libenow's stories! Mother recovered sufficiently to come back to Potrerillos in May. Alfred was due to come home for a school vacation in June, and she was really trying to get herself together for this. She was partly paralyzed in the left side, and had no feeling in her left hand. She threw herself into a frenzy of sewing, and was able to turn out her usual good work. When Alfred came, she went to Antofagasta to meet him. He was certainly shocked, since he had only been told that she had been "unwell". We also went out with Dad and climbed Cerro Hueso behind the mine, which was 17,500 feet. This was a real hard all day climb but very satisfying. This was my new altitude record. I later climbed both Vicuna and Dona Inez. The mid-year school break signaled the end of my schooling at Potrerillos, and I attained the brevet rank of teenager. There was a great bunch of kids there, and I will try and list as many as I can remember. The Love girls, Sue and Pat, Nona Couse, Betty Vetersneck, Donna Johnson, Joan Novak. My photos were all lost in a house fire in 1990. We partied, visited each other’s houses, danced, partied some more, went to all of the social functions at the Andes Club, and drank all of the table wine we could get our hands on. There was a passable band at the Club (Eddy y sus Muchachos) that played real good dance music. Expeditions were mounted to the “Otro Lado” to visit the Teatro Andes and freeze to death. Other trips were made to Agua Dulce for picnics and the like. 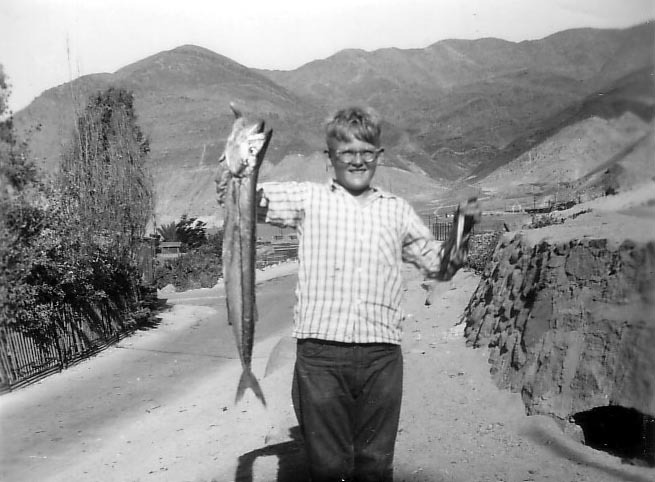 My departure from Potrerillos was on August 12, 1956, having not quite spent a year there. I should have stayed and finished Grade 8, but I was being hustled out of the house so that I did not have to watch my Mother die. It was obvious that there was a lot wrong by this time. What did I get out of Potrerillos? The answer is a lot. I learned about the unconditional love that people put out to you when you live in a proper community. I learned that poor people with almost no education could have wisdom, pride and politeness in a measure beyond that of well to do people with education. I also learned that adults can and do spend a lot of time on younger people trying to make them into something. I thought that the best men that I knew were engineers, and decided to become one of them. Mrs. Marsh taught me how to write, and made me learn the rules of grammar, which are still in there somewhere. I retuned to Potrerillos many times over the next 7 years, but was never to live there again. My Mother passed away there on April 21, 1957, and that made living in El Salvador for summer vacations a better thought. We went over to Potrerillos for parties, but the old flavor was not there. Her death seemed to have changed much for me, but the fine and warm people were still the same. In nearly 50 years not a day has passed that I do not think of that first year in Potrerillos and its people. Man cannot make the clock of life run backwards, but if I could, I would return it to September 1, 1955. I had hoped to be at Barquito on September 1, 2005 with my half brother Paul to celebrate a defining point in my family’s history. Unfortunately, business pressure has made the trip impossible.